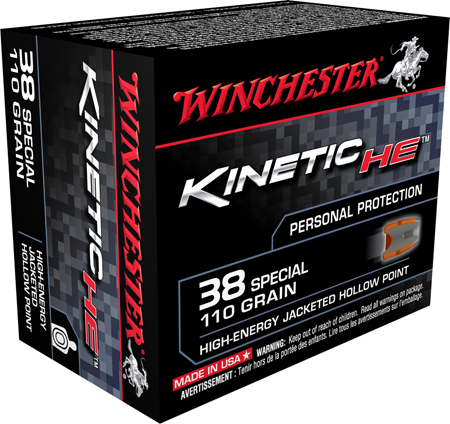 Winchesters line of Kinetic HE High Energy handgun ammunition is specifically designed to maximize energy at close range. It has threat stopping power and the high energy needed for personal protection or concealed carry. Kinetic HE utitlizes jacketed hollow point bullets that expand upon impact and nickelplated casings for reliable cycling along with Winchesters proven technology to insure reliable energy dispersion and maximum stopping power.